Pope Benedict XVI Encourages Reading "Story of a Soul"
The Story of a Soul conveys St Therese of Liseux's "Little Way" of spiritual childhood - her "elevator" to Heaven, as she called it. This method was approved by Pope Pius XI as a way for all to grow in holiness through unfailing confidence and childlike delight in God's merciful love. Again and again in this book, St. Therese shows us how her "Little Way" of love and trust comes straight from Sacred Scripture. This book belongs in every Catholic home, for Pope St Pius X stated St. Therese of Liseux the "greatest Saint of modern times". 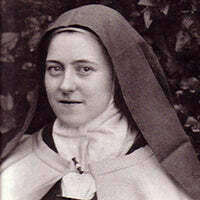 St. Therese of Lisieux was a Roman Catholic French Discalced Carmelite nun widely venerated in modern times. She is popularly known as "The Little Flower of Jesus" or simply "The Little Flower". Therese felt an early call to religious life, and overcoming various obstacles, in 1888 at the early age of 15, she became a nun and joined two of her elder sisters in the cloistered Carmelite community of Lisieux, Normandy. After nine years as a Carmelite religious, having fulfilled various offices such as sacristan and assistant to the novice mistress, and having spent her last eighteen months in Carmel in a night of faith, she died at aged 24, following a slow and painful fight against tuberculosis. If I had to flee my home and had room to take with me only ten books, knowing that I might not be able to acquire any more Catholics books again, this would be one of them. (And I'm counting my Cornelius a Lapide Commentaries on the Gospels as five books.) It is simply that good. How can I explain? Jesus says that we must become little children in order to enter the kingdom of Heaven. In my opinion, Therese shows and explains to us how to do that better than anyone ever before-- after Our Blessed Mother. So, if you really want to get to the heart of the Gospel, go to Therese. That's why Therese is a Doctor of the Church. However, although the book is simple, it can be misunderstood. For example, as a teenager, I didn't understand the spirit with which Therese did all her little sacrifices and ended up going a bit cuckoo over it. I recently finished a companion to The Story of a Soul called "A Retreat with St. Therese" by Fr. Pere Liagre. I would include this in one of my top ten books as well due to how well it explains Therese's teachings. I would recommend reading read Story of a Soul first and then following up with Fr. Liagre. Beautiful. It inspires in one the desire to grow in holiness, to grow closer to God. Truly a must-read.